•The IB1000 has 4 non-isolated RS232 ports. 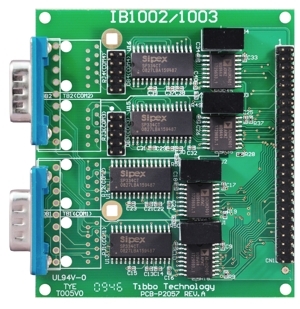 •The IB1002 has 4 non-isolated universal ports that can work in RS232, RS422, and RS485 modes. •The IB1003 (shown below) has 4 electrically isolated universal ports that can work in RS232, RS422, and RS485 modes. These boards can optionally be used with the TB1000 terminal block adaptor.